We are a small nonprofit foundation that was founded by Hal and Norma Taussig based in Media, PA. We have a wonderful board, small staff and some wonderful pro-bono consultants. We invest in bold businesses that create dignified work and positive social and environmental change. We blaze trails for transformative economic models such as Fair Trade, B Corporations and ethical investing. 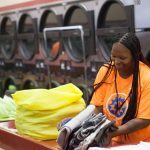 Wash Cycle Laundry (Philadelphia and Boston) proves that commerce can be carried out on bikes, delivering clean and green laundry. Half of their employees are returning from prison or drug rehab, people who are typically rejected by employers. Here, they are given a good wage, benefits, and trust. Yellow Leaf Hammocks (San Francisco and Cambodia) is a brand-new investee. The “People of the Yellow Leaves,” the Mlabri, create beautiful handcrafted hammocks which are sold on the international market for the benefit of these hardworking, family-oriented communities in Thailand. And hammocks – who doesn’t love a hammock for relaxation? We also advocate for Mission Aligned Investing. It’s a way for nonprofits to directly invest in the change that they are working towards every day in their programs. It requires a significant shift in thinking, away from traditional stock market investments. The Untours Foundation can lead by example: we’ve been doing mission aligned investing for more than 25 years, before there was a name for it (and we’re still here!). We know that business can be part of the solution to our shared global issues while strengthening our local communities. Our travel company, Untours, has been walking this talk for over 40 years. Wherever we can find the best models of social and economic innovation and inspiration, typically in underserved and oppressed communities. We support businesses in Denver, Mexico, Ghana, and beyond. Take an Untour – our wonderful travel company helps to sustain our work. Encourage your friends to do the same – and give them a brochure! You can donate funds anytime (but we aren’t asking!) or invest in our Charitable Remainder Trust, a way to have a fixed income while benefitting the Foundation. Finally, please share your Untours story and why you love the Foundation with your friends and family. Thank you! Want to print this out? Click here to download a PDF.